Whether kayaking is his regular passion or something he did on a recent vacation, he'll really enjoy the creative and colorful kayak male personalized Christmas ornament in our plush velvet gift pouch. These handcrafted hobby ornaments personalized for added meaning include a handsome cord for displaying them on the tree, in the cottage or nearly anywhere. 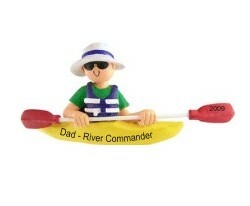 The male kayaker personalized Christmas ornament works for holidays, birthdays, other special occasions or "just because" too.